The Official 2005 – 2008 KTM 250 SX-F, SXS-F, XC-F, XCF-W, EXC-F Manuals can now be legally accessed online. No waiting, no shipping charges and no hassles. Conveniently access your owners manual, engine service manual, fork manual and shock manual from anywhere – works with all computers capable of viewing PDF files. Note: This product is available to residents of North America only. Dealers can access this manual through our Cyclepedia PRO Product. If you are a dealer please Click Here. Access the Official 2005 – 2008 KTM 250 SX-F, SXS-F, XC-F, XCF-W, EXC-F Manuals NOW by CLICKING HERE – No waiting, no shipping, view it from anywhere, print it out – take it to the garage. 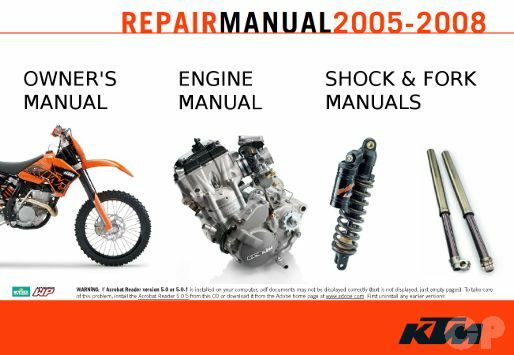 If you need to service your 2005 – 2008 KTM 250 4-stroke motorcycle – this subscription is for you.